Vanguard (noun): a position at the forefront of new developments or ideas. 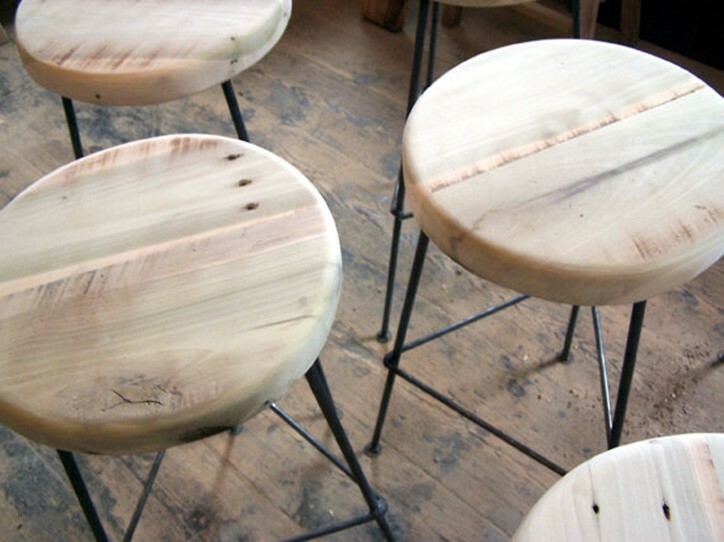 We’ve named our backless saddle stool the Vanguard because it was one of the first reclaimed wood bar stools that caught our eye. 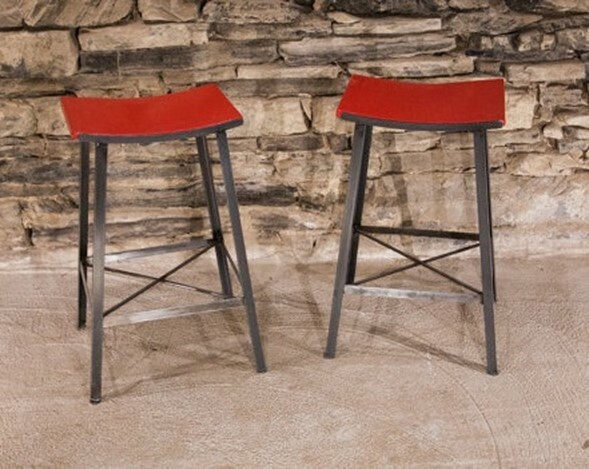 With its welded metal frame and gently curved seat, the Vanguard is setting the bar (stool) for simple comfort and chic style. 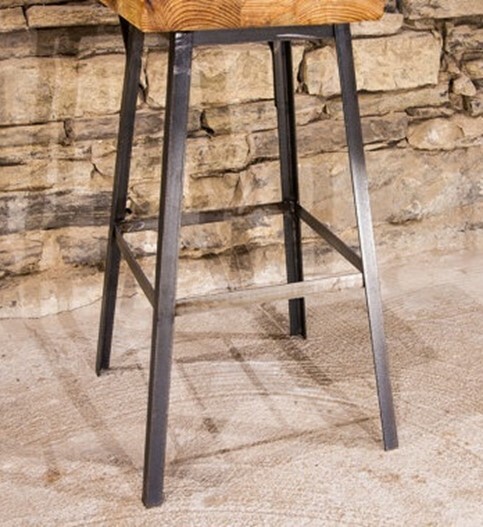 Our Vanguard saddle stool is constructed of welded industrial metal legs and a scooped reclaimed wood saddle seat. Meet Clive — he’s one cool customer with welded metal legs, an artisan-crafted wood seat, and a curved back so that you’re as comfortable as he is. Never one to conform, Clive is fully customizable with wood finish options for his seat and powder coat options for his back and legs. 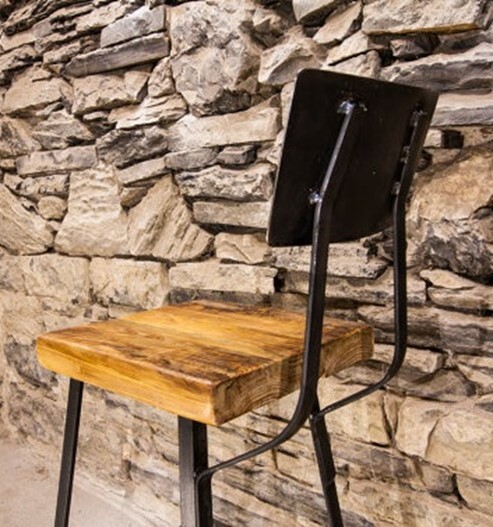 Our Clive bar stool is constructed of welded industrial metal legs, solid reclaimed wood seat, and comfortable curved back. and emphasized extreme simplification of form and color. 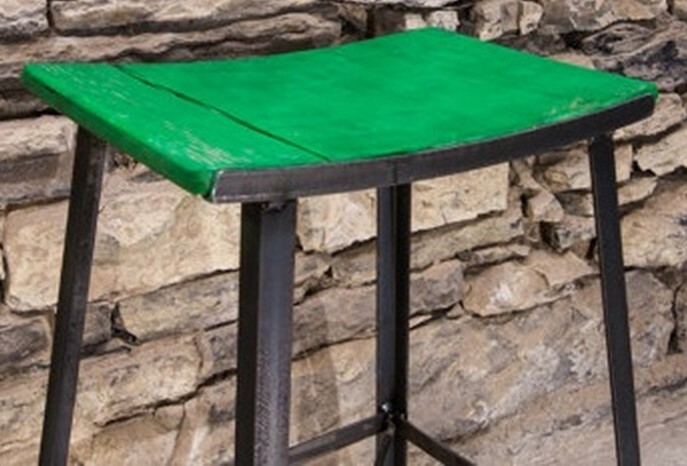 Meet the Minimalist saddle bar stool. With sleek, low-profile lines and a slim metal frame, Minimalist would be as at home in a chic artist venue as she would be in a hip craft brewery. This is an example of minimalism of form at its finest! 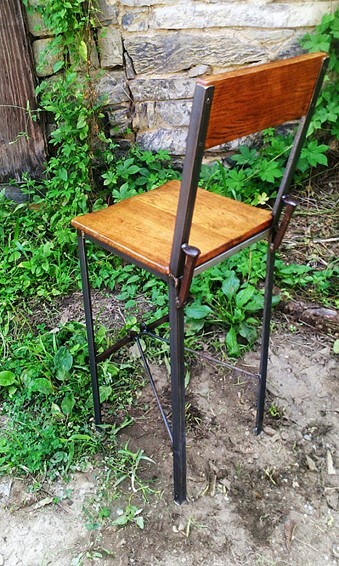 Our Minimalist bar stool is constructed of solid reclaimed wood with a comfortable saddle scoop, welded industrial metal legs, and gently reclined low profile metal back – pictured with a Dark Walnut stain. The goal of Mid-Century design was to bring modernism into America’s post-war suburbs. This style emphasized creating objects with an open, flowing design that seemed to bring the outdoors inside. Form and function were equally important. 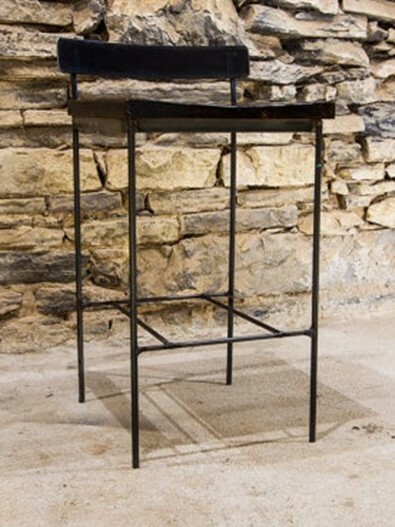 Today, our Mid-Century Mod bar stool is the epitome of these two elements combining to create one well-designed object. 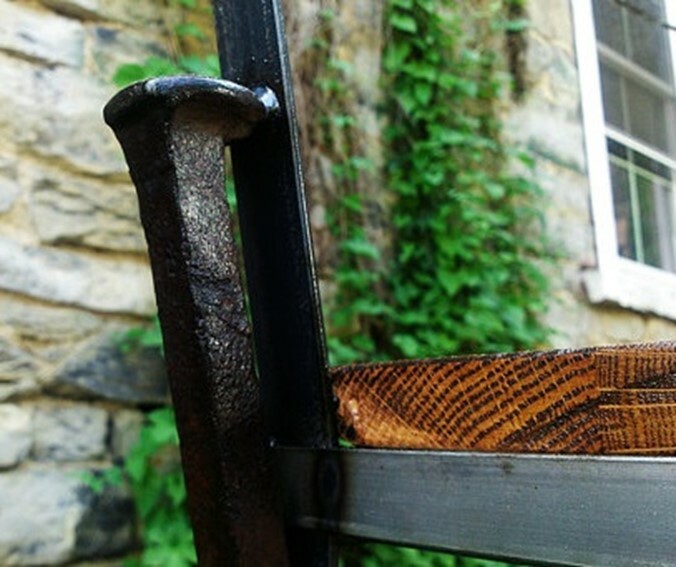 Its metal frame seems to flow from one curve to the next, while the solid reclaimed wood seat is gently curved around the edges for maximum comfort. 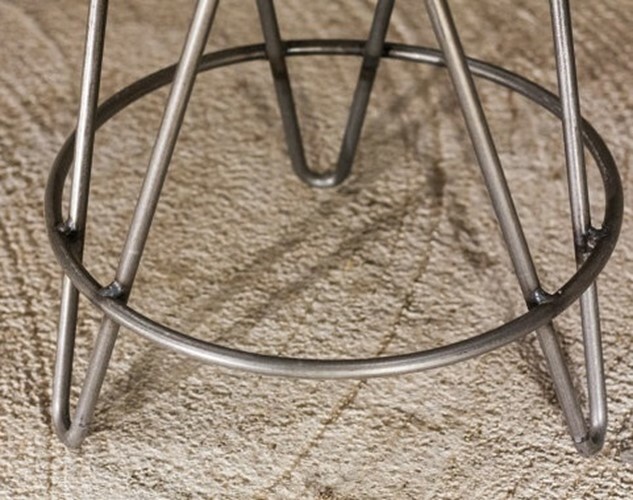 The Mid-Century Mod stool is our nod to the designs (and designers) of yesteryear. 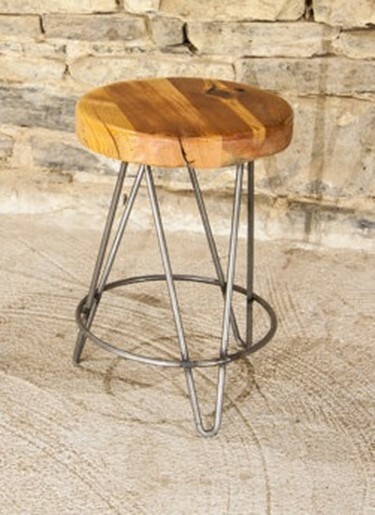 Our Mid-Century Mod bar stool is constructed of solid reclaimed antique wood and welded industrial steel legs – pictured here with 120 year old solid reclaimed pine wood and raw steel base. 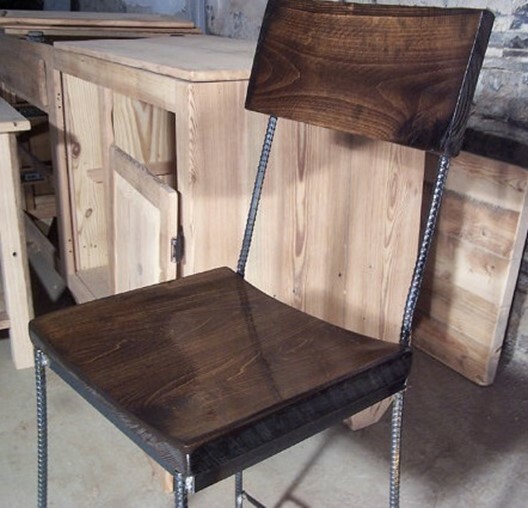 Modern industrial furniture often boasts the scars of a hard-won battle. Burn marks, scratches, and patina simply add character to the piece — the user is left wondering what the object’s story is. 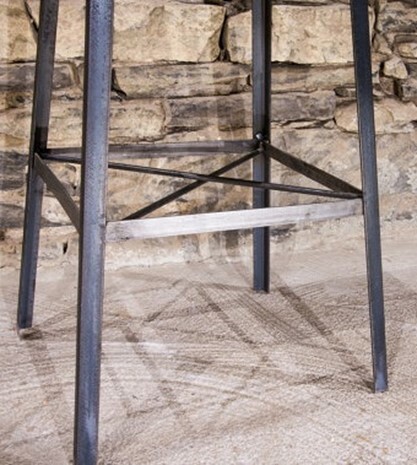 Our enigmatic Industrial saddle stool will never tell the tales she knows, but she will offer a comfortable place for someone else to sit and tell their tale (or drown their woes). 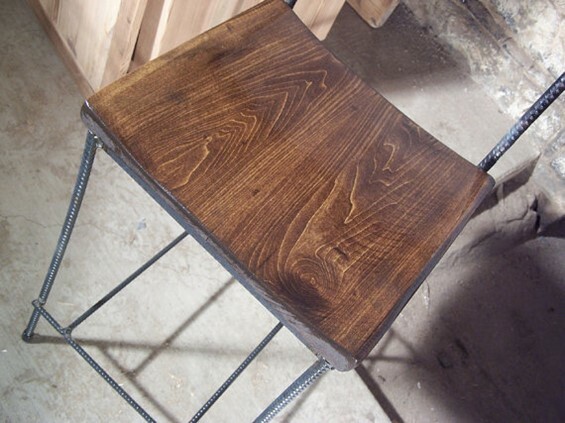 Our Industrial saddle stool is constructed of solid reclaimed wood with a comfortable saddle scoop and welded industrial metal legs – pictured here with Dark Walnut stain. 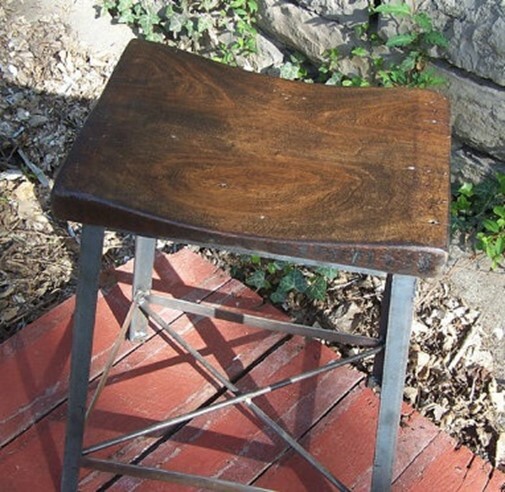 In the early 1900s, Toledo Company stools were designed with schools, industrial shops, designers, and architects in mind. Their uniquely shaped silhouettes, constructed of wood and metal, created a timeless look that was equally at home in a variety of venues. 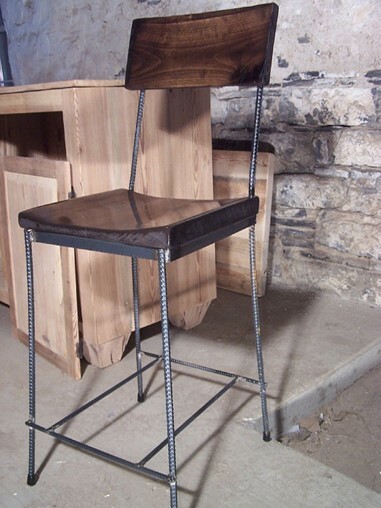 Our Toledo Style swivel bar stool calls to mind its ancient ancestors. 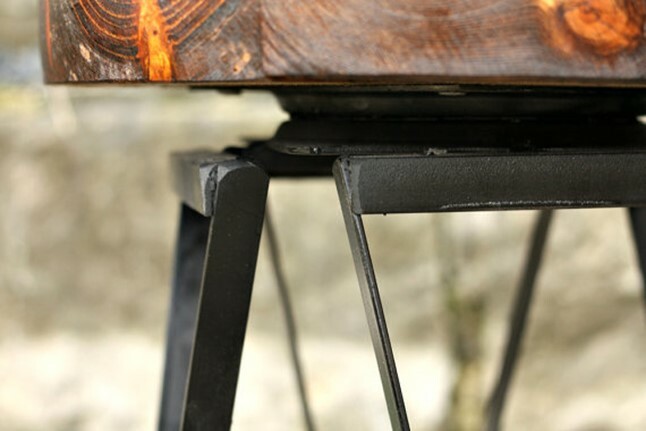 Four metal legs arch out from one point on the frame, creating a more fluid flair than what’s seen on a traditional Toledo stool. The addition of the swivel mechanism means that draftspeople and patrons alike can maneuver to their ideal location, as the mood strikes them. 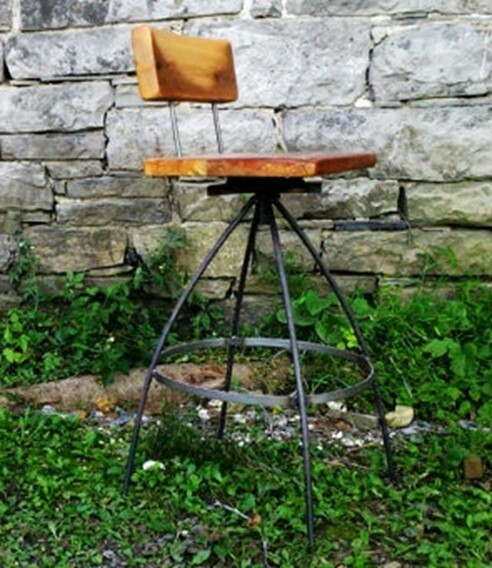 Have your customers exclaiming, “Holy Toledo, this stool is great!” Toledo Style swivel bar stool for the win. 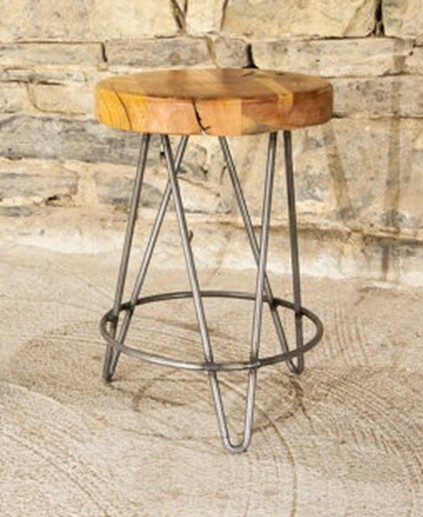 Our Toledo Style swivel bar stool is constructed of solid reclaimed wood and welded industrial steel legs – pictured here with 120 year old solid Pine seat and a raw steel base. 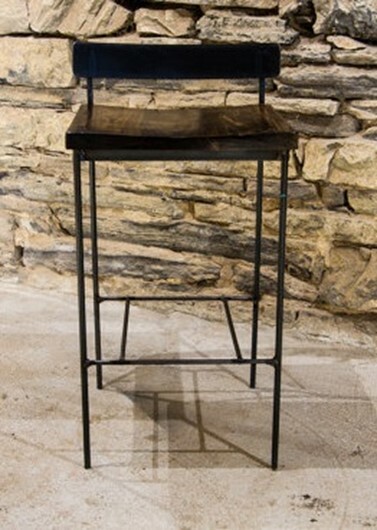 Designed as a tribute to the famous Toledo drafting stool of the early 20th century, our stool has a classic industrial chic vibe. The legend of Casey Jones and his steam train captures the spirit of a proud America at the dawn of a new century, and details how the man himself was dedicated to the ideal of work and duty. 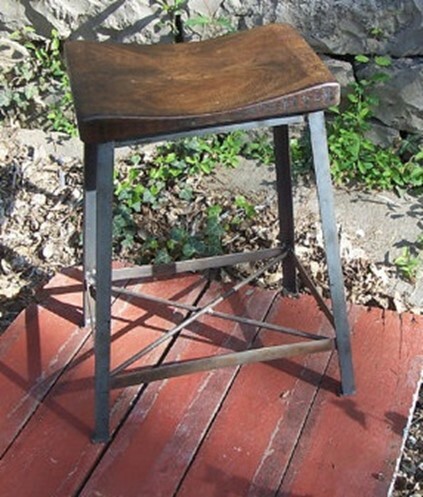 Our Casey Jones bar stool shares a lot in common with this mythical man, which is why we named it in tribute. 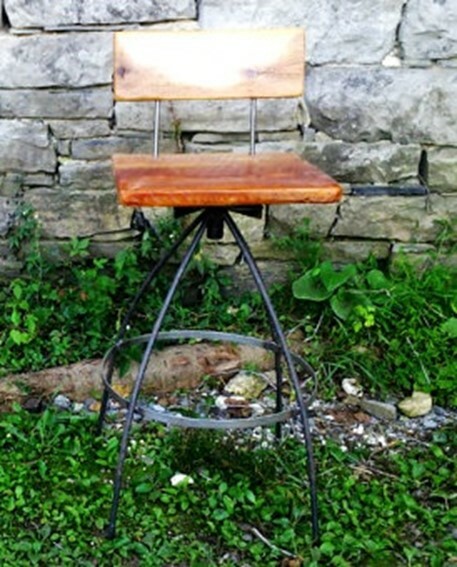 Much like the true Casey Jones, our bar stool has a work ethic that goes above and beyond. Both man and stool are solid, stoic, proud sons of America whose integrity is unparalleled. 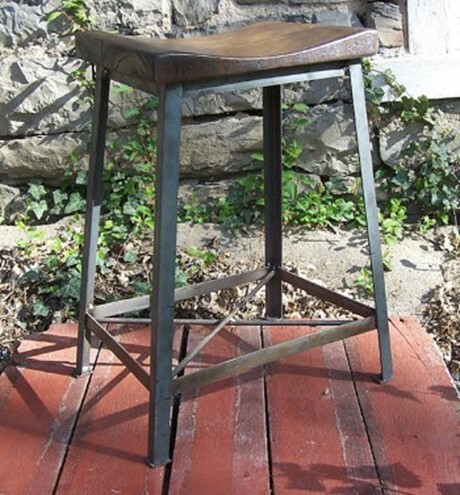 In homage to the railroad that Mr. Jones dedicated his life to, we’ve included railroad spike footrests and back accents on this bar stool. 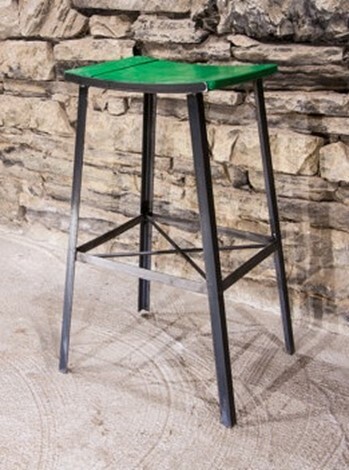 Our Casey Jones bar stool is constructed of solid reclaimed wood, slightly scalloped seat, and welded metal frame featuring bent rebar supports – pictured here with waterproof oil urethane. 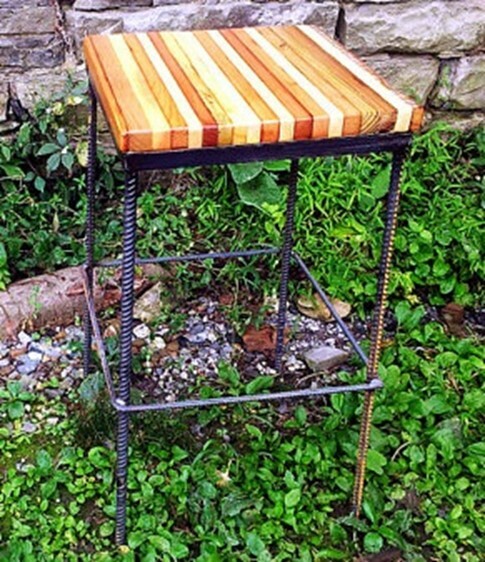 Features railroad spike footrests and back accents. During the Industrial Revolution, factory interiors reflected the zeitgeist of the times — there was no need for ornamentation or embellishment, nothing gaudy to distract the eye. The goal was a functional environment in which a job could be efficiently done. 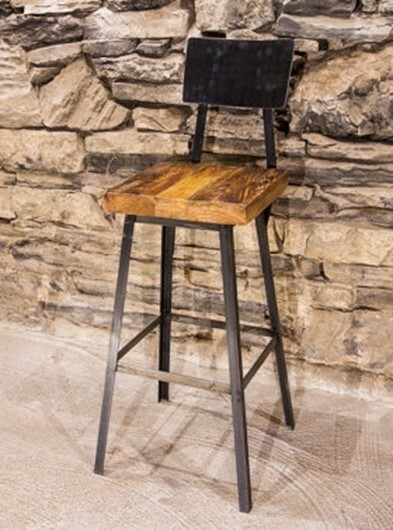 Our Factory bar stool has strong, sleek lines paired with a solid reclaimed wood seat, and its metal frame is reminiscent of the machinery that populated those early factories. 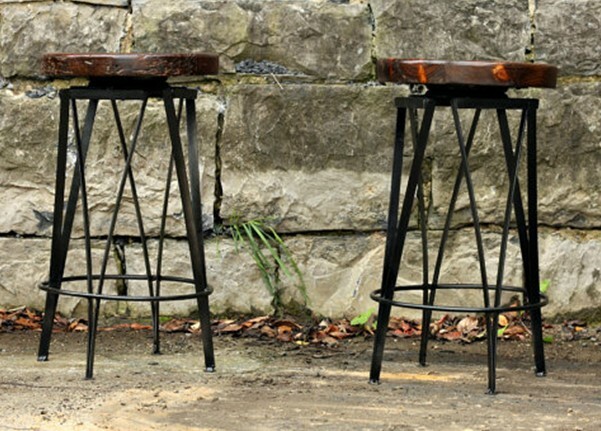 Our Factory bar stool is constructed of solid reclaimed rustic tulip tree and smooth blacked steel industrial style legs – pictured here with unfinished wood. 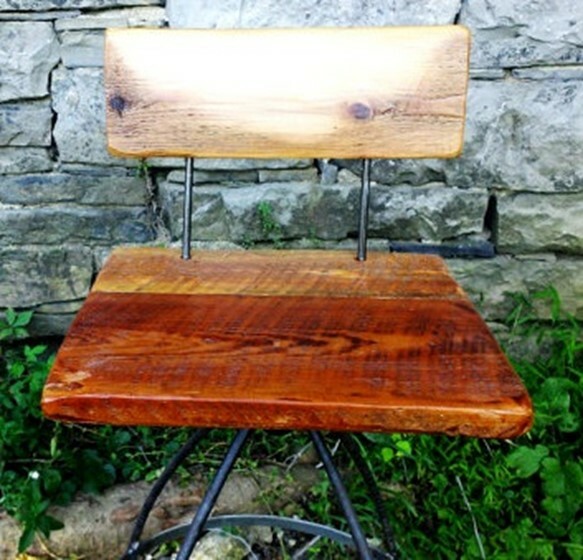 Live edge is a furniture style where the natural edge of the wood slab has been incorporated into the design of the piece; thus, the origin of the wood is readily apparent. A log is cut into slabs and the entire slab is used, leaving the natural — or live — edge. 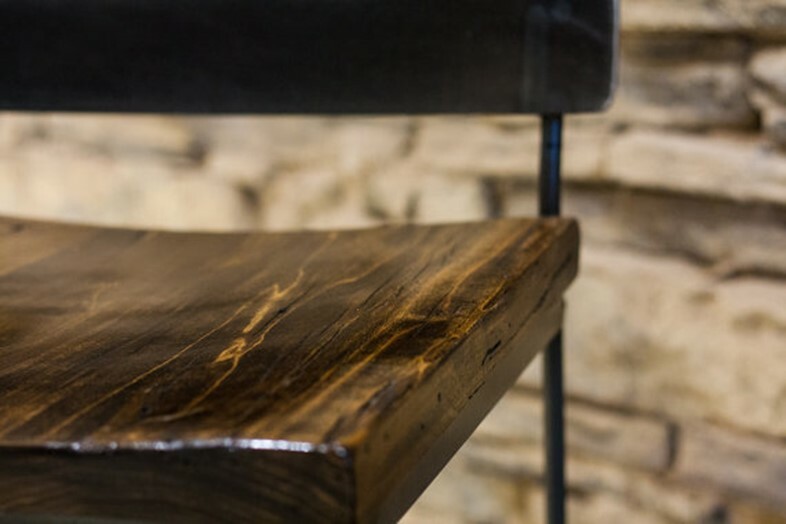 The live edge ideology combines three main elements: natural beauty, superb craftsmanship, and simple design. 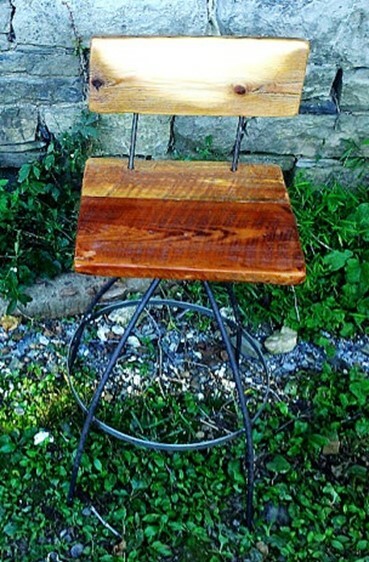 Our Live Edge saddle stool is constructed of solid reclaimed wood, with salvaged tin footrest – pictured here with wood from a 1901 orchard barn in the Shenandoah Valley. Rebar (noun): a framework of ribbed bars of steel, designed to reinforce. For hundreds of years, people have been utilizing rebar in construction. It is one of the most commonplace materials in the construction industry. These reinforcing steel bars are something most of us never think twice about, though they’re used in almost every modern building we enter and every road we drive on. 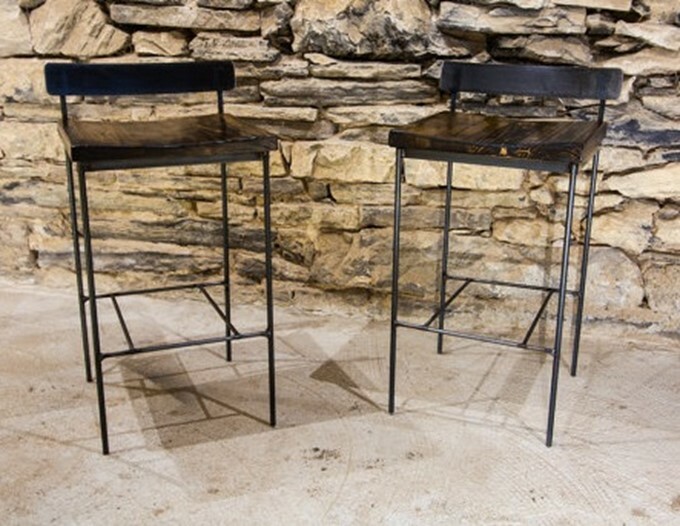 Our Re bar stool was designed with strength and longevity in mind, just like the everyday structures shored up by rebar. 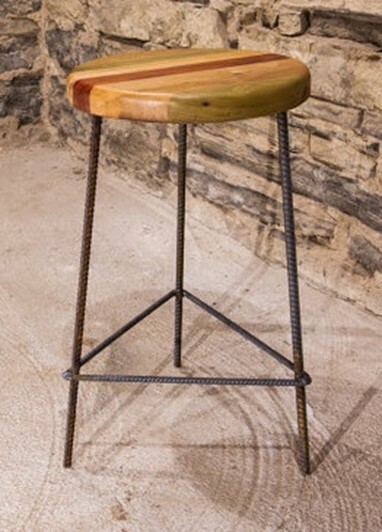 The combination of reclaimed wood and rebar steel creates a one-of-a-kind industrial bar stool. 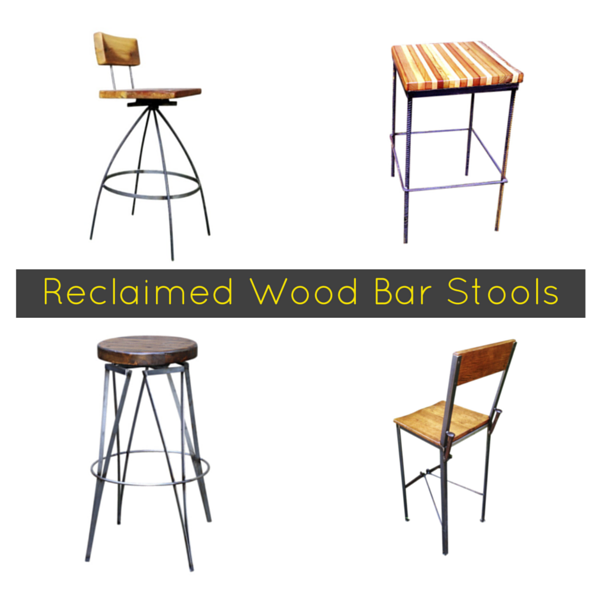 Our Re bar stool is constructed of solid reclaimed wood, with raw rebar metal legs – pictured here with a Dark Walnut stain. 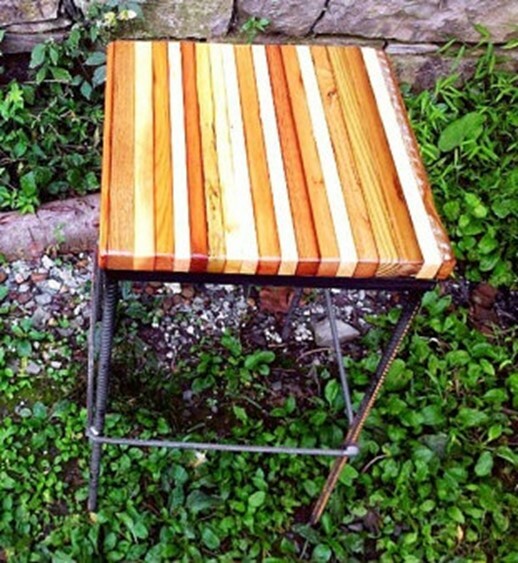 Meet Hue, our butcher block backless bar stool. 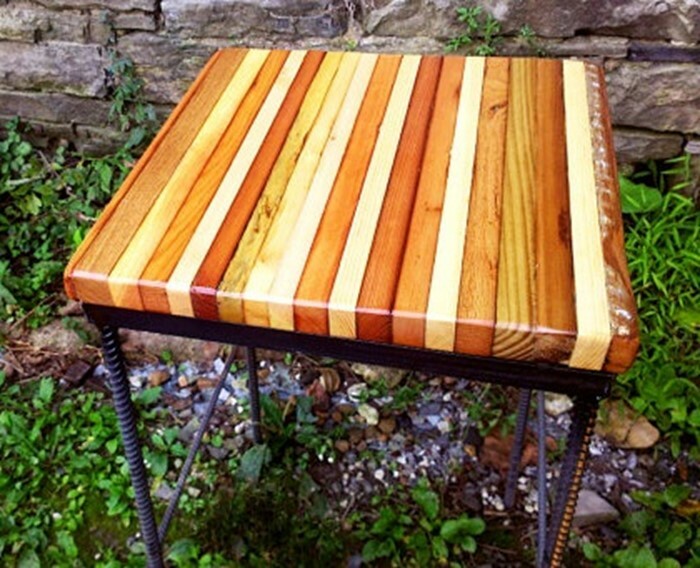 In case you didn’t know, butcher block is a style of assembled wood. 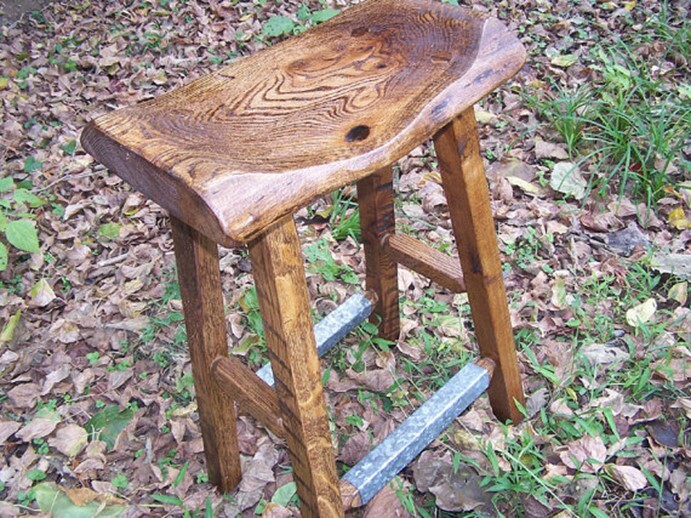 Our friend Hue is as unique as they come, since every stool is constructed from a variety of reclaimed wood types. Besides his obvious good looks, another advantage Hue has is his ability to be refinished if dings, nicks, or scratches occur. 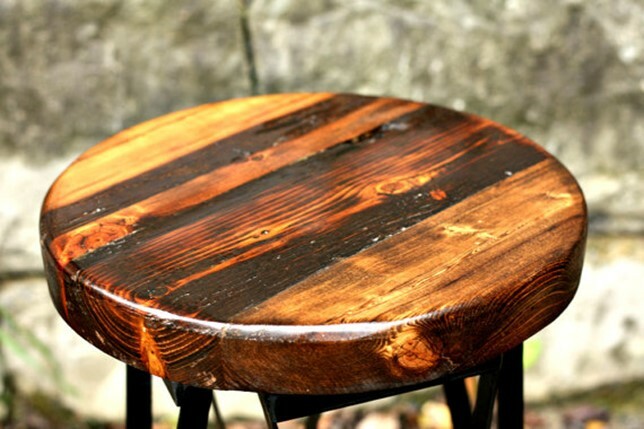 He can be sanded down and resurfaced, giving restaurateurs a like-new stool at very little expense. Yep, Hue’s a keeper. 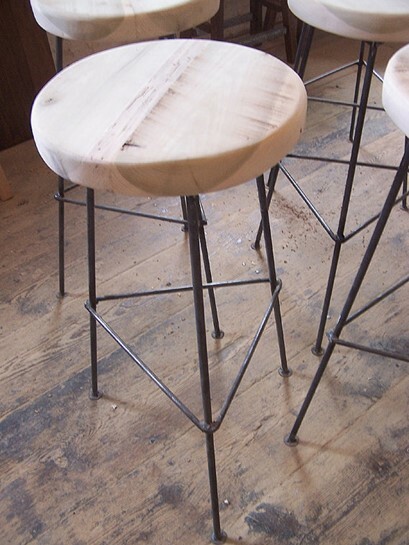 Our Hue bar stool is constructed of solid reclaimed woods in a butcher block style, raw steel base, and rubber booties on each foot to prevent scratching. 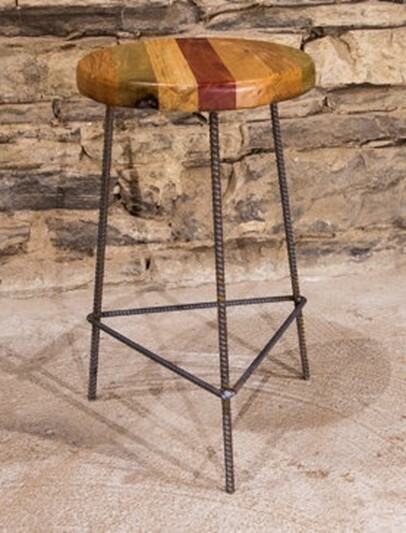 Our Saloon swivel bar stool looks like it would be right at home in the days of the Wild West and Wyatt Earp, yet is also modern in its appearance. 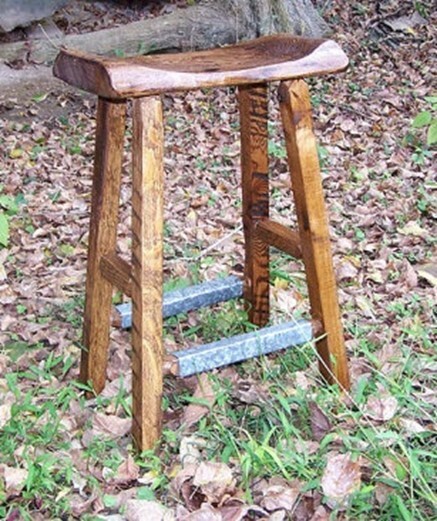 With a rustic reclaimed wood seat that shows the life the wood has lived, our Saloon stool just keeps getting better with age. The raw steel frame is starkly geometric, offering a visually stunning counterpoint to the rounded edge of the seat. 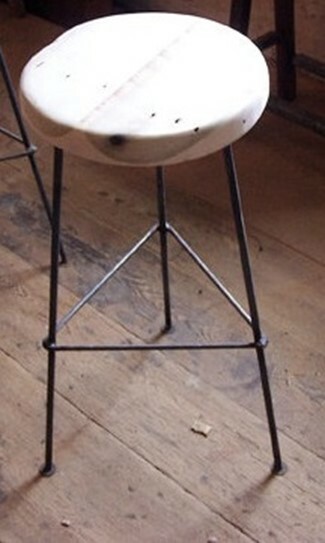 If the Wild West and the MoMA had a love child, this backless bar stool would be it. Saddle up and get your swivel (bar stool) on — the Saloon is calling. 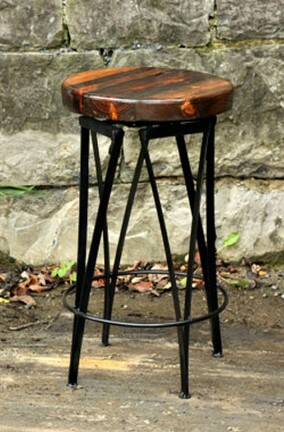 Our Saloon bar stool is constructed of 120 year old reclaimed pine wood, with welded industrial steel legs – pictured here with a Provincial stain and painted black base. These stool feature a heavy-duty ball bearing swivel mechanism, and metal disc on each foot so that felt may be applied if desired. 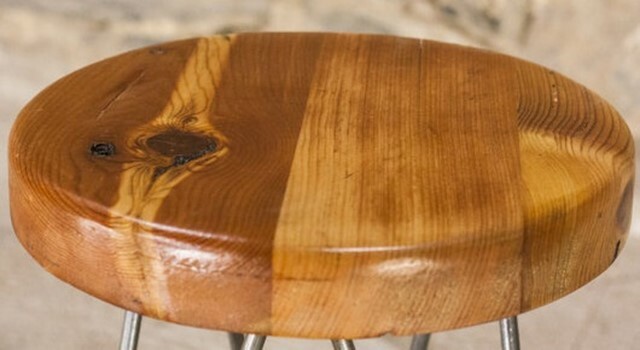 We took one look at this bar stool and the name just came to us — Chroma. 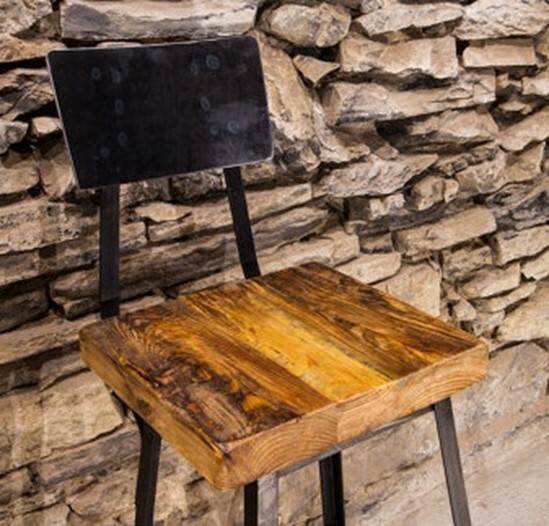 With an assortment of reclaimed wood types and colors melding into one gorgeous bar stool, the Chroma is without a doubt a statement piece. 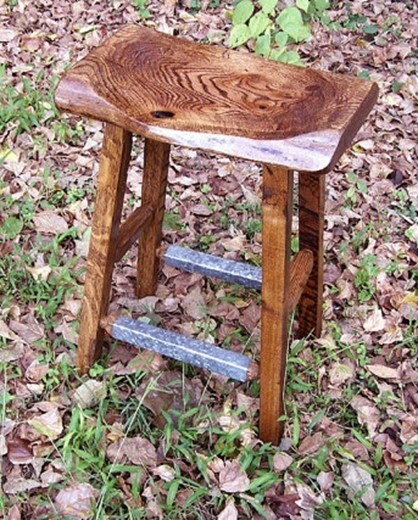 Offer your clientele this visually stunning stool, which happens to be comfortable and sturdy, to boot. You can’t go wrong with the Chroma, she’ll easily enhance any setting. 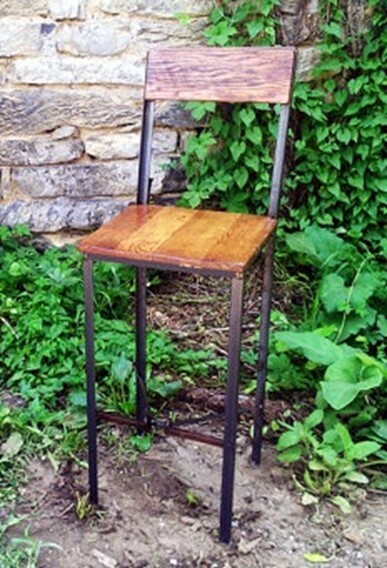 Our Chroma bar stool is constructed of colorful strips of reclaimed woods, with a welded rebar industrial metal frame. 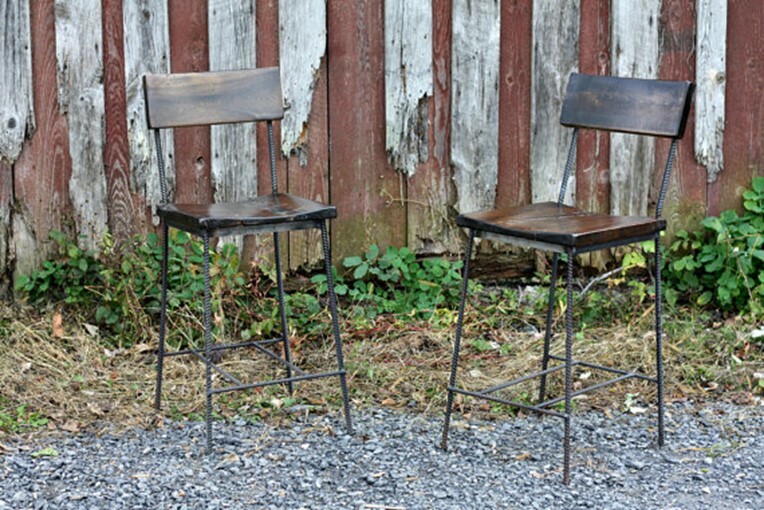 RestaurantFurniture.com offers a huge selection of outdoor and indoor commercial-quality chairs, tables, heating, umbrellas, and booth seating — all priced for professionals. Visit us today! If you’d like to make an inquiry please call (844) 771.1955, email sales@restaurantfurniture.com, or LiveChat on the website. Enjoyed this post? Sharing is Caring!